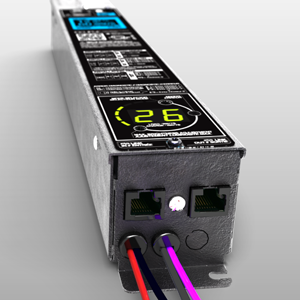 The LIGHT MANAGER is an advanced power supply for architectural LED lighting systems. It is available in many constant voltage options: 12V, 15V or 24V. It is also equipped with a maximum adjustable brightness control as well as a primary cut-off switch for easy on-site configuration. The LIGHT MANAGER is compatible with ON/OFF switches, 0-10V dimmers and can be linked together for group control and management. Adjustable maximum brightness rotary switch and mode selector button for on-site adjustment and configuration. Standard RJ45 cable used to link LIGHT MANAGERS together for group management and control.